Displayed below is an archive of projects that are more personally than critically important. Each body of work loosely acknowledges an ongoing interest in commemoration, memorialisation and non-conventional use of ceramic materials. Many of these works informed larger, major projects but I consider them to be minor in the grand scheme of my art practice. Pinch/coil built recycled clay, anagama ash & copper. Individual average: 19.5 X 11.5 X 11.5cm. 2017. At Rest was created during a six-week international artist residency at Shiro Oni Studio in Onishi, Japan. Although related to research on visual arts’ role in memorialization and the representation of personal & collective memory: At Rest is an experimental body of work, intended to reference both time and place during the May–June residency program at Shiro Oni Studio in Japan. At Rest presents a series of urns, which are historically embedded in the act of commemoration. Each vessel is characterized by unfamiliar making techniques and are an example of the environment in which they were made. This is via my use of local clay, new processes and a rare firing experience. Each urn houses the remaining ash of an anagama wood firing used to permantise each vessel. 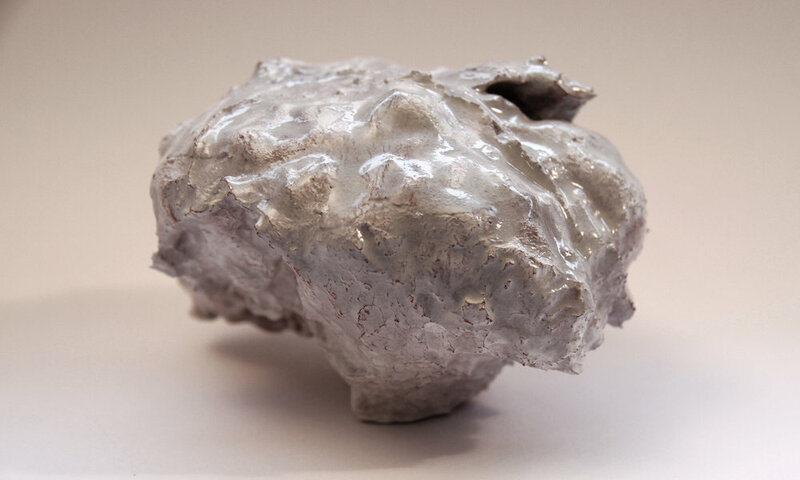 The urns also contain broken pieces of my fellow resident artists’ work lost in the firing process. Situated on the mountainside near Onishi, the anagama kiln and 5-day firing process is ancient and intensive. This series was created in anticipation of firing that particular kiln. The vessels are individually characterized by every stage of their production, and have been created as a kind of memorial to process, connection and learning. Glazed terracotta, miscellaneous ceramic waste, animal bone fragments. 10.5x9x7.5cm, 2015. Head Space was produced at an Ateliers Fourwinds Art Centre residency, Provence, France (June-July 2015). This work is the lone result of extensive experimentation and trials during a 5-week residency at Ateliers Fourwinds, Provence, France. During this residency I dedicated most of my time to research and large scale project development, while also dedicating time to trial several non-conventional techniques. 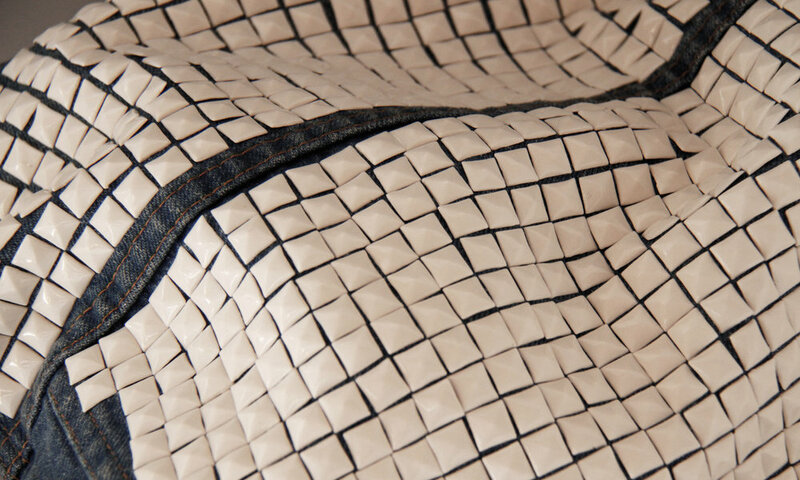 Head Space involved the use of animal bones to house and shape a mixture of ceramic waste materials and terracotta slip. This process produces ceramic fragments that roughly map and resemble the cavities within bone. 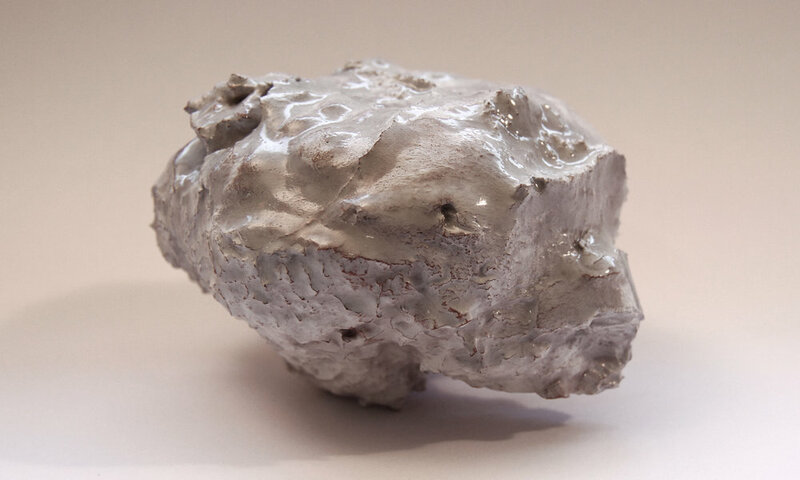 In the case of this piece, the host bone was a cow skull found at the foot of the Alpilles in Provence, which was destroyed during the firing process. This left primarily ceramic objects, infused with fragments of the original skull. This single piece stands as the resolution to a variety of unanswered, material-based questions that continue to inform larger, major projects. Press moulded limoges porcelain studs, glaze, metal wing clips, denim, 50x60x8cm, 2015. Never Again was produced at the AIR Vallauris residency program, Vallauris, southern France (May-June 2015). This piece references an early influence, passion and lifestyle that continues to inform my art practice. It also represents memories I have of a personally significant and motivating exhibition entitled Run With Us held in West End, Brisbane, 2008. Kick wheel thrown, wood & electric fired ceramic bowls, glaze, variable dimensions, 2015. Take and Give is a collaborative project created as a resident artist at La Grande Maison, Caen, Lower Normandy France (March-April2015). Take and Give is an exhibition resolved by Lukas Richarz (France) and Dan Elborne (Australia). Viewers are encouraged to participate by taking a bowl from the installation and share in the meal presented within the space. The meal is free of charge and afterwards viewers have the option to either return or purchase the bowl itself. All money raised will go towards helping the homeless community of Caen through the Caennaise SQUAT association. 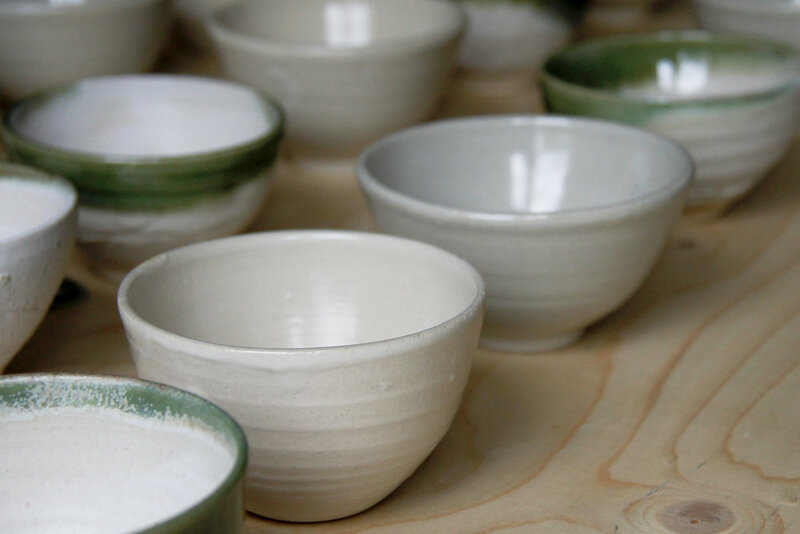 Primarily influenced by the globally recognised Empty Bowls Project, as well as Richarz’ ongoing initiative: Moment; Take and Give invites participants to contemplate the value and simple beauty of a shared meal free of financial and social constraints. 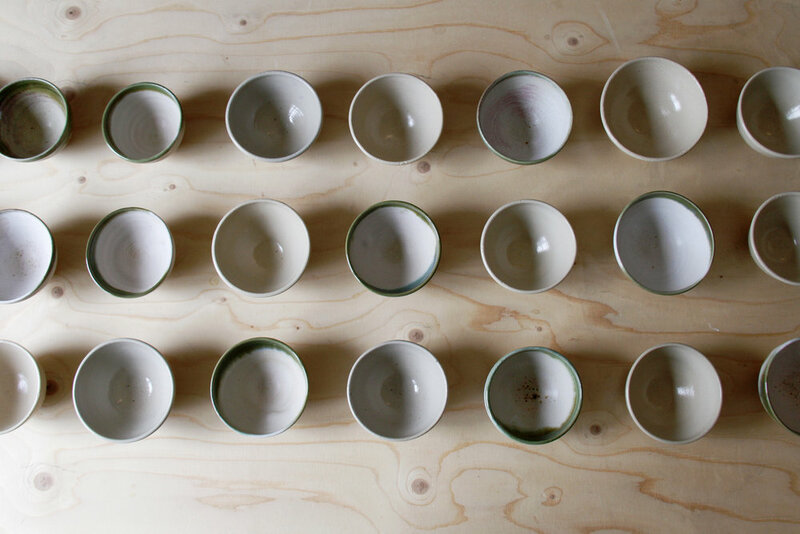 The bowls themselves represent a motivation for helping those in need with something often taken for granted. Through their purchase, they become relics of a collective interest in giving. The following gallery presents more variations of bowls I created while in Caen. Slip cast earthenware, glaze, manipulated decals. 500x.303 bullets, 2012-13. These photographs show the first version of this project created from 2012-13. Since then, I have developed a new floral ‘delftware’ inspired design, which is better suited to the history this work represents. To view the second version of this project (completed in 2016), follow this link: Five Hundred. Hand built porcelain, glazed and decorated with decals. Varied dimensions. 2012. This work is inspired by the tradition of untouched dinnerware gathering dust in cupboards and draws. 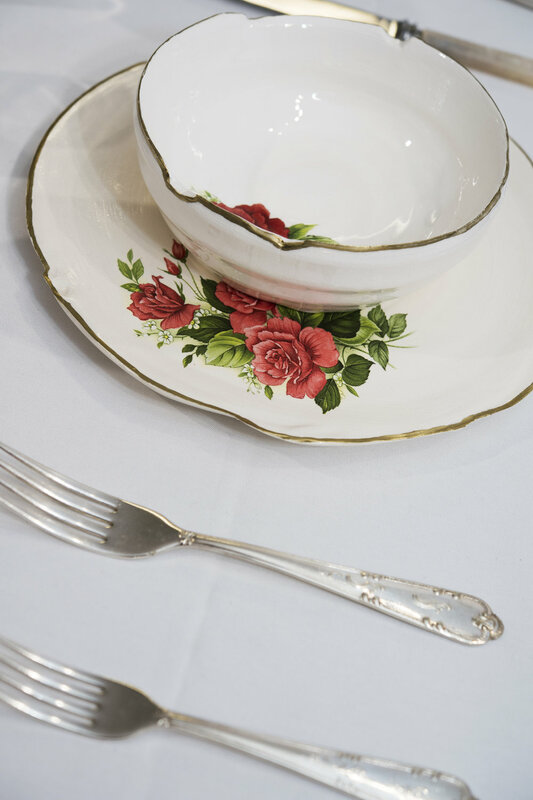 Grandma’s Good Set explores the idea of functionality becoming void due to the handmade qualities and assigned value of these stagnant dinner sets.